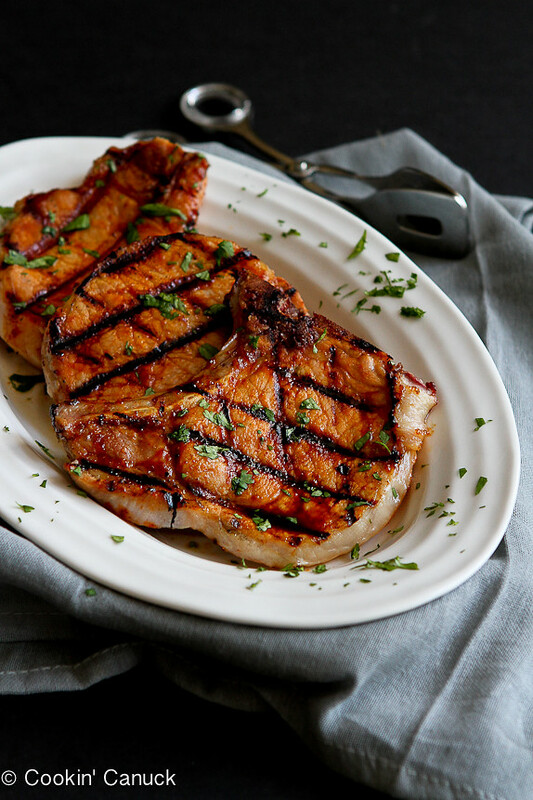 Dress up grilled pork chops with this amazing and simple pineapple chili glaze. The result is tender, succulent pork that is ready in 15 minutes. 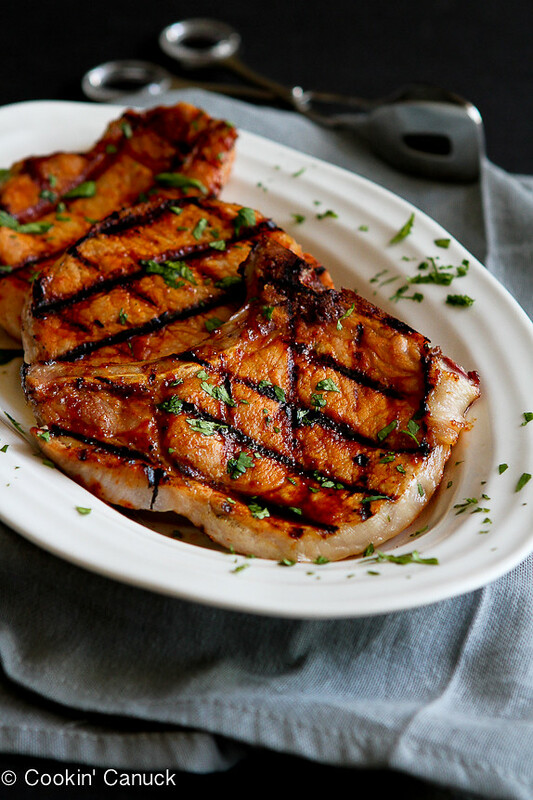 Every time I make grilled pork chops, I think to myself, “Why the heck don’t I make these more often?” You would think my eldest son’s fist pump and whispered, “Yes!” would encourage me to make them more often. I blame my stubbornness on a long-ago memory of dry, flavorless pork chops (don’t worry, Mum, I’m not talking about anything you cooked!) I have a feeling I’m not the only one who has some of those memories. They’re right up there with boiled Brussels sprouts. Now I’ve discovered grated, sautéed Brussels sprouts and the trick to cooking the perfect pork chop. Okay, so the trick is nothing earth shattering. In fact, it’s quite simple. Don’t overcook the darn things! Are you thinking that they need a couple more minutes? No way! Pull them the heck off the grill before you think they’re done and then they’ll be perfectly juicy and tender. This glaze recipe is slightly adapted from an amazing recipe by my friend Pam Anderson which was published on the Food & Wine Magazine website. We made the glaze with pork tenderloin, then topped with a peach salsa, for a Fourth of July celebration. I wanted to capture those flavors, but use them with pork chops for a recipe that would be easy to throw together on the busiest of nights. I feel the exact same about pork chops! I always make chicken..even though I have a ton of pork in the freezer. Clearly I need to thaw those babies out and drench them in this glaze. Love the spicy/sweet thang going on! Love the super concentrated flavors in the glaze. 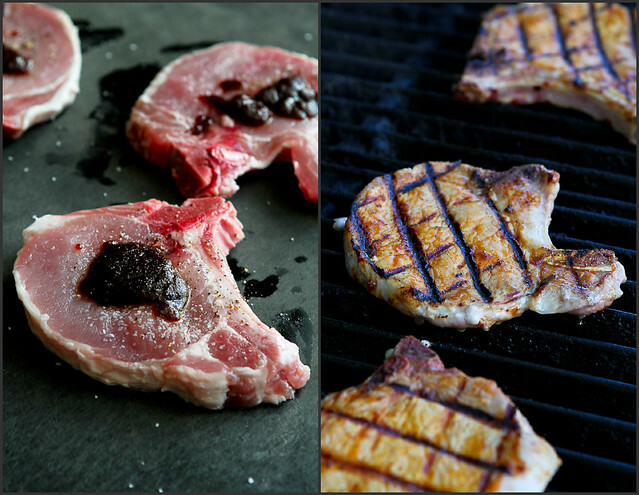 I know what we’re having for dinner tomorrow – these chops! 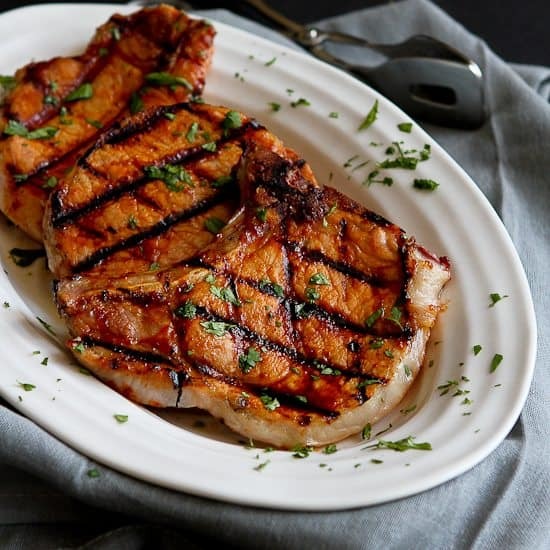 We’ve been on a pork chop kick lately! I’ll have to try this recipe on the chops in my fridge for dinner tonight! Also, beautiful grill marks! You’re the grilling master! Pineapple and pork chops? Two of my favorite things! i seriously do not cook enough pork chops. they look delicious grilled! Definitely making this for my family- so delicious! Love the pineapple chili combination! Perfect for pork! Look at those grill marks! Amazing. Love sweet and savoury together, too. Such a treat! 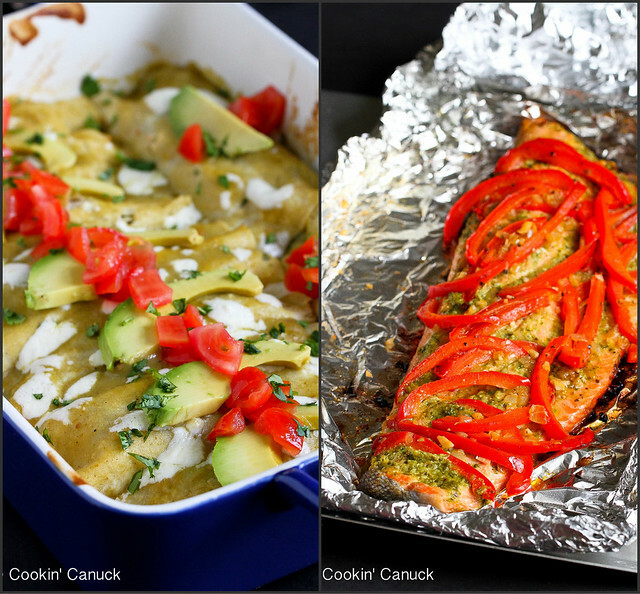 And those vegetable enchiladas linked up look to die for! Heading to check those out now. Thanks for sharing this! I will give this a shot. Pineapple and pork chops is a marriage made in heaven. Great recipe Dara, it needs to happen on my bbq asap! Made these tonight for the meat eating faction of my family, as it was above zero degrees for the first time since December. They were easy to make and very well liked. Thanks! I’m so glad to hear that, Vivian! I’m glad you enjoyed them.